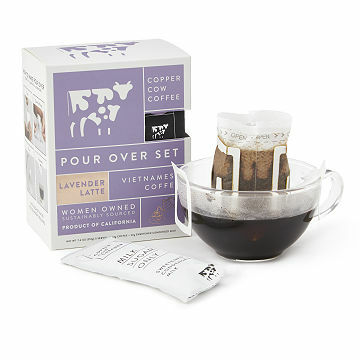 Satisfy lavender latte cravings at home or on the go with Debbie Mullin’s easy, portable pour over kits. Addicted to the local coffee shop's lavender lattes? We sure are. The floral notes pair so delectably with warm milk and good coffee. Satisfy your craving whenever, wherever, with Debbie Mullin's small batch, portable kits. She fills compostable pour over filters with ground dark-roast Vietnamese beans and organic dried lavender. Just fit a filter over your mug, add hot water and sweetened condensed milk (included), and your brew is ready to sip and savor—after inhaling its divine aroma. Coffee sourced from Vietnam. Lavender, milk, and sugar from California. We spoke with Debbie about her background, her trip to Vietnam, and the myth of a "typical day" in her shoes on the blog. She also wrote about WomenMadeLA, the collective she formed with two other UG makers, for us. Debbie Wei Mullin was raised around East Asian culinary traditions since childhood. When it came time to start her career, Debbie knew she wanted to share the flavors of her culture with a wider audience. She thought, what better delicacy than Vietnamese coffee: The rich, aromatic drink blended with sweetened condensed milk. Debbie spent many months in Vietnam, sampling over 40 different coffee suppliers as well as roasting styles, grinds, and brewing methods. She became particularly close with the farmers in the central highlands, and thus her delectable design was born. Debbie's pour-over kit has everthing you need to make Vietnamese coffee on-the-go, whether while traveling, camping, or just at the office. She lives and creates her culinary treats in Los Angeles. We spoke with Debbie about her background, her trip to Vietnam, and the myth of a "typical day" in her shoes on the blog. She also wrote about WomenMadeLA, the collective she formed with two other UG makers, for us. (Check it out).